Home eyebrows I bleached my eyebrows! Sorry about no post yesterday. My doctor put me out of work again...i'm just a sicky! I'm feeling better now though...enough to get back to another post. This is from a few weeks back...The title says it all. I was inspired by my girl Joy to finally do something about my brows. While my natural hair color is jet black...the only time you can see it is when my roots are growing out. I always color my hair usually in the brown with golden highlights category. As a result, I usually pick a lighter color to fill in my eyebrows. My girl Joy mentioned that she used bleach to lighten her eyebrows. I had never tried it before but was intrigued. I decided, why not...I could always fill them in anyways. I went to my local grocery store and picked up Sally Hansen's Cream bleach for a few bucks. The instructions are super easy. You mix the bleach and the activator and just apply to the hair you want lightened. I made sure to do a test spot on my inner arm 24 hours before. If you have super sensitive skin like me, make sure to do this to ensure that you don't have any crazy reactions. I took this super glamorous shot of me with the bleach, lol. I applied it covering my entire eyebrows and while I was at it, I threw some on the 'stache. I left it on between 8-10 minutes...the recommended time. I shot a before and after so you can see the difference. As you can see, it's subtle but still definitely makes a difference. My eyebrows are now a brownish shade as opposed to black. This makes it so much easier to fill in my brows! I think going a shade lighter than your hair color to fill in your brows is also vary flattering to the face...it lightens up ones look. 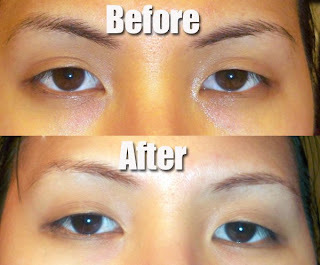 Too dark brows can often look heavy and harsh. 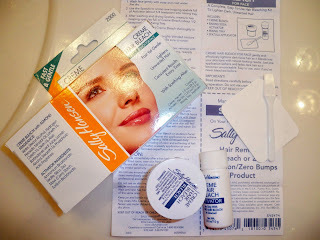 If you're interested in lightening your brows, give Sally Hansen cream bleach a shot! Girl, you are crazy for that pic! lol. I usually lighten my brows too when I lighten my hair. I love you for that picture. I would do something like that. LOL! I love the look....I've done my brows before but I am scared to do the upper lip. Just my luck it would burn, hyperpigmentation would set in and I'd walk around with a fo real 'stache. Hahaha! ...and get well soon, mama. I have the exact same bleach...gotta love that almond scent lol. But I bleach my brows with this twice a month now & I really adore the product. Cheap & effective! Oohh, wow.. I've never tried! wow renren keepin it real! my eyebrows are actually kind of naturally light. i didn't really know how to fill my brows in till about a year ago. Rather than bleaching my brows, I had a lighter, more reddish colour tattooed onto my brows. It's still going strong, and it's been 11 months. I had it done at the salon at the Sheraton Jumeirah Beach hotel. Your brows look really nice! lol the pic with the bleach on your face is silly. this is one of those products that changed my life/makeup game. i used to clown my sister for doing it, but then realized how simple it is and what a difference it makes. using brow set alone doesn't do it for me... i have to bleach my brows. if you have issues (like i did) with wiping the cream on and off to get the right lifted color, extra strength takes care of that in like 2 secs. put it on for a few, wipe if off ... all done! wow thanks for sharing! i'm actually considering trying it out myself, but i'm just kinda worried what if it kills my brows and they won't grow back anymore?? lol. thanks for the shout out girly! it really is subtle but makes filling in the brows so much easier! 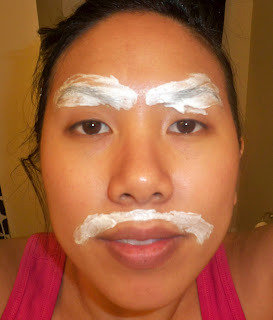 i am SOOOOOO trying this my eyebrows are blaaaaack! I read somewhere that you could use peroxide on them.. But that is too long of a process in my opinion and I'm impatient. My mom is a beautician and I talked to her about it and I have naturally dark eyebrows.. They are literally almost black. My mom said that the peroxide would probably turn my eyebrows orange. I'm going to buy the bleach that you used.. and try this.